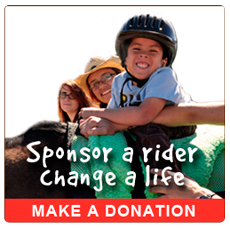 The Hoofbeats with Heart “Horses for Heroes” program assists military veterans and their families with reintegration after deployment, service members suffering from PTSD and trauma including physical and mental injuries. To accomplish this mission, we employ licensed, credentialed professionals. We work through the Department of Veterans Affairs Medical Centers and clinics, as well as with individual veterans. This program encourages positive change in the lives of our servicemen and women and their families. Due to the nature of combat experiences and the extremely stressful conditions in which soldiers are required to survive, men and women in the military sometimes become seriously ill or injured. Post-traumatic stress disorder (PTSD) is an extremely common condition. Blast-related injuries to the head have resulted in an usually high number of soldiers who suffer from moderate to severe traumatic brain injuries (TBIs). Perhaps the greatest healing challenges are experienced by soldiers who struggle with the crippling effects of both a TBI and PTSD. 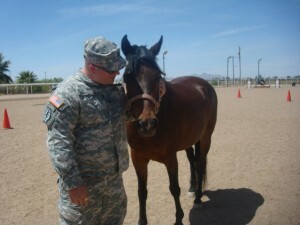 Hoofbeats with Heart understands the critical nature of soldier’s injuries and situations. Our unique ability to help these men and women, through equine therapy and traditional counseling from the Veterans Administration is a powerfully healing combination.